This Kutol 2565 Health Guard antiseptic lotion hand soap contains .1% PCMX, an effective antimicrobial agent that fights the spread of germs. This high sudsing formula kills germs fast and rinses away easily for superior sanitation, making it ideal for restrooms and hand washing stations. It also offers a pleasant floral scent, leaving employees and customers feeling fresh. Unlike other soaps that may leave hands dry and cracked with repeated use, this antiseptic lotion hand soap contains emollients that promote softer skin and prevent drying. Your staff members and guests are sure to appreciate this added benefit, especially during the cold months when hand washing can be a painful experience. This soap is Triclosan-free. 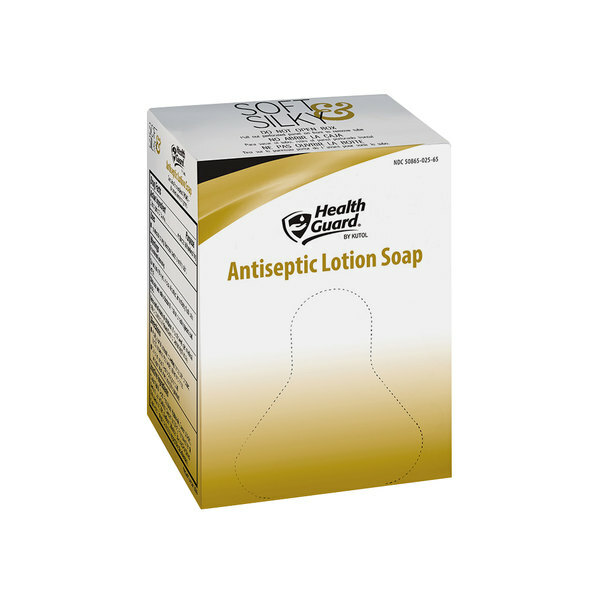 Kutol 2565 Antiseptic Lotion Hand Soap 800 mL Bag-In-Box 12/Case is a great value per case. I like the added lotion to the soap, it doesn't seem to dry out our hands as much as other soaps we have used in the pass. We bought this product to go with the soap dispenser we previously purchased. It is very reasonably priced and has a nice scent. We use this product for our hand-washing sink. I only bought one because I wanted to test it prior to buying a large case. Wow! what a deal on great soap. These work just the same as the name brands, but at a lower price, plus its better soap and packaging too. This soap smells fresh and is easy to fit in the matching holder. The packaging conserves space (and shipping charges). While we haven't done any scientific analysis we haven't had any contamination after washing. We will definitely reorder.